Do you ever feel overloaded by the never-ending stream of e-mail, voicemail, texts, and tweets? Are you overwhelmed by the magazines, newspapers, websites, blogs, and radio and TV shows that are supposed to help us stay on top of what's happening in the world around us? Dr. Thomas Cooper's newest release Fast Media/Media Fast is a guide to finding peace, perspective, purpose, productivity, and one's creative voice amidst the media- saturated world dominated by the "triple-ups": speed-up, blow-up, and keep-up. 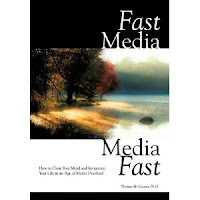 He suggests a "fast" or break from all forms of media, an experiment he's conducted with multiple groups of people. Come explore the possibilities with him. Books will be available for sale and signing.